I am at the flyball seminar! The puppy and green dog part was pretty good. A lot was basic puppy training that I already am familiar with, but it was good foundation information for new dogs and new green handlers, too. Tatum didn’t do very much because she is being pretty nervous. I pulled out her mat (as you can see from the picture) because I knew that having her do some things she already knew how to do would make her feel better. So we did mat work and some sits and downs and shakes and she was taking livers. She took some treats from people she didn’t now, but when she was out on the running lanes she really didn’t want to take any treats. But it is a great first trip for her. The townhouse I am staying in with my teammates is very nice and Tatum gets to sit on the couch and mingle with the other dogs. Chase is being a bit grumpy so he is in his crate. He is actually putting himself in his crate when he gets too overwhelmed by the other dogs so he is being a very good boy. And we have our own room so Chase and Tatum get to be with me a little bit on our own. Tomorrow we will have Chase’s seminar and we will see how that goes too! Great that you are having fun and getting Tatum out and about! Hope the weather is nice! Awe bless him! Hope you are having a great time. Hey Astrid the weather was nice Friday and Saturday, but too windy Sunday. Hi Lora, we had a great time! I wish they would have had flyball when I was younger. It looks like so much fun. 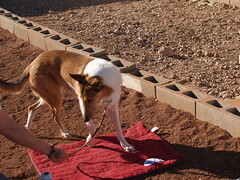 Previous Previous post: Touch n Go Flyball Seminar in Vegas! Next Next post: Flyball Seminar is Fun!